In Sharekhan PMS Review I raised a point about the performance of PMS compared to Nifty and few of the best funds. Many reader’s had the question – why I was complaining on a 45,000 Rupees gain in couple of months on an investment of 500,000 Rupees. The answer was (and is) – I could easily beat that. So today I will share with you how. Let me first show my trades. 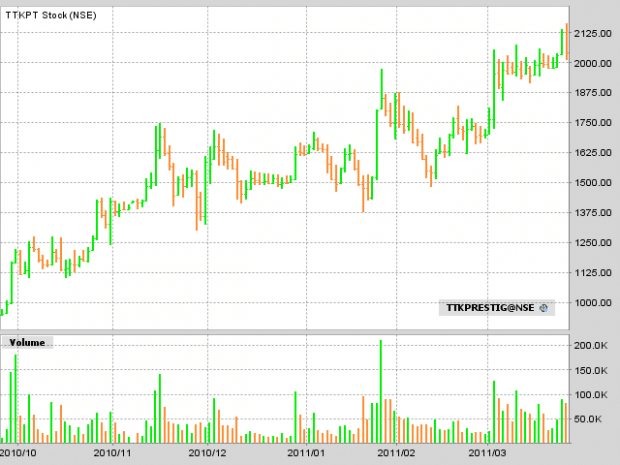 I Purchased 615 share’s of TTK Prestige around price range of 1995. Hold for a day and sold off at close to 2080. I thought I purchased 600 units only and did not realized that I had few more in my account and so finally sold rest of my shares the next day. You can see the date and time for my trades. Reason for my purchase of TTK Prestige was purely technical. Look at the 6 months chart of TTK Prestige. Shows a break out chart pattern above 1974 and was consolidating above the breakout level. So I took an anticipated trade (You know how to handle anticipated trades from my chart pattern book). I saw positive sentiments in the market especially the consumer durables sectors and timed my entry into the stock almost perfectly. I could not time my exit well enough or else my profit would have been 50% more but I was not ready to risk my huge profit. When I reviewed Sharekhan PMS I did a lot of performance comparison and so it would be unfair if I don’t compare my own performance. I made a gain of roughly 4%. Nifty for the complete week Nifty was up by almost 4.8% and though I did not trade much on the Friday still I would say I could not better Nifty for the week yet was not very far behind but still a miss mainly because of a huge upswing on Nifty on Friday. Let us compare my performance with one of the best performing fund i.e. DSPBR Small and Mid Cap Fund Growth. It had a NAV of 16.31 on 22nd March and 16.82 on 25th of March i.e. I would have gained 38k on my investment whereas I made more than 50k for myself. I would also have been charged an exit load of 12k as well. Clear an out-performance by a BIG BIG margin. Remember I am not a full time trader and my main job is online blogging and so If I could perform in the market better than the best fund then anybody who is willing to learn can. There is lot of money to be made provided you are willing to learn. Charts by Interactive Broker’s Trader Workstation.